This PDF 1.4 document has been generated by Writer / LibreOffice 4.2, and has been sent on pdf-archive.com on 29/10/2016 at 09:33, from IP address 74.128.x.x. The current document download page has been viewed 816 times. pamphlet will help you find the resources you need during your studies. Cheers and happy learning! 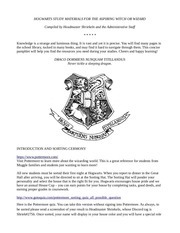 Muggle families and students just wanting to learn more! earning proper grades in coursework. with the name of your house. If you need tips on wearing your uniform properly, please refer to our dress code at the following links. to see if they will accept an EDX certificate. technical and scientific. If you are interested in STEM, Coursera may be a good place to start. order, making it easy to review a subject in one sitting. the world so you are sure to receive quality instruction here. university entrance tests, CLEP exams, or the SAT and ACT. use Wikipedia s a final source. are proud to list it among Hogwarts' recommended research tools and knowledge libraries. speaker to practice talking with you. line variance at an early stage. rapid-paced Muggle world. Below you will find several links to technology courses and learning sites. Remember, many of the Compendiums also feature technology courses of a high caliber. that are expensive to buy, but can find a PDF version. love, the Hogwarts Faculty and Staff. This file has been shared by a user of PDF Archive. Document ID: 00501361.